I’d been looking forward to seeing Witness for the Prosecution since I read about the venue where it’s being staged. As well as seeing this Agatha Christie play you get the chance to enter a very ‘London’ venue. As this is a courtroom drama it was a stroke of genius to use The Chamber in County Hall as the location. This historical building on the South Bank was opened in 1922 and was used as the London County Council’s offices until 1986. 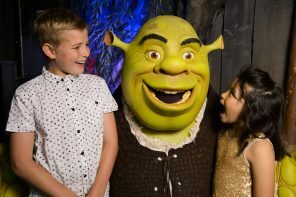 The building now houses two hotels, several restaurants, private apartments, London Sea Life Aquarium, the London Eye ticket office, London Dungeon, Shrek’s World of Adventure and a conference centre. For this performance, The Chamber stands in for The Central Criminal Court, better known as the Old Bailey. 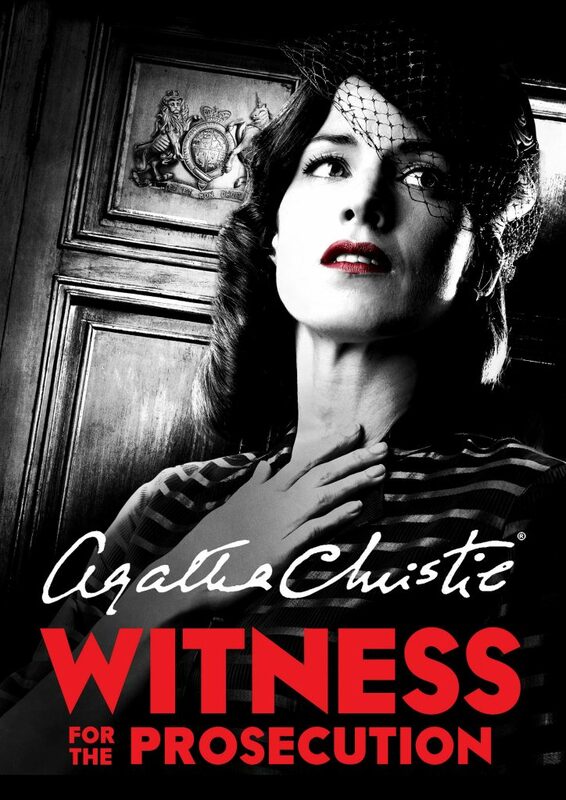 Directed by Lucy Bailey (Comus, The Graduate, Titus Andronicus), this is the first major London production of a play written by Agatha Christie to open since the 1960s. It’s a gripping tale of justice, passion and betrayal, with the audience thrillingly placed in the thick of the action. Agatha Christie was a prolific writer. Over five decades she produced 66 crime novels, 6 non-crime novels and over 150 short stories. Christie was fascinated by the whole business of deceiving an audience right to the end of the play. She wrote over 20 plays of which the most famous, The Mousetrap, is the longest running play in the world since it opened in London in 1952. Witness for the Prosecution was originally adapted by Agatha Christie from her short story Traitor Hands published in 1925. It took until 1951 for her loyal theatre producer Peter Saunders to suggest expanding it for the stage as a courtroom drama. The play received its West End premiere at the Winter Garden theatre in 1953 and was a huge hit; opening to equal acclaim on Broadway the following year. Witness for the Prosecution is part of an exciting new wave of adaptations of Christie’s work on stage and screen that are giving audiences a fresh perspective on her work. Following on from the TV shows aired last year, the BBC has commissioned seven new adaptations starting with Ordeal By Innocence. In November, 20th Century Fox’s feature film adaptation of Murder on the Orient Express is released, directed by and starring Kenneth Branagh. The all-star cast also includes Judi Dench, Johnny Depp, Michelle Pfeiffer, Penelope Cruz, Olivia Colman, Willem Dafoe and Derek Jacobi. 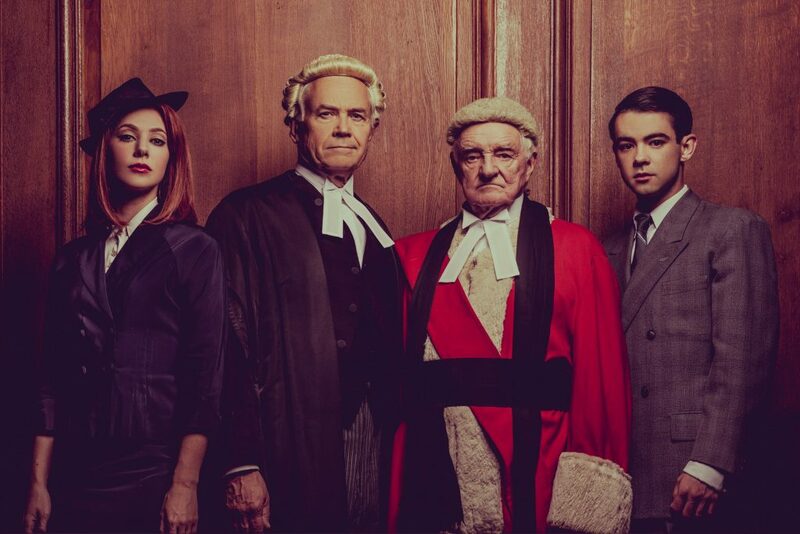 Witness for the Prosecution has a cast of fifteen including Catherine Steadman, Jack McMullen, Philip Franks, Patrick Godfrey, Roger Ringrose and David Yelland. Catherine Steadman, best known for her role as Mabel Fox in Downton Abbey and nominated for an Olivier Award for her performance in Oppenheimer, plays the role of Romaine while rising star Jack McMullen plays Leonard Vole. Philip Franks (who I recognised from The Darling Buds of May and Heartbeat) is Mr Myers QC and Patrick Godfrey (Da Vinci’s Demons, Heartbeat) plays Mr Justice Wainwright. Roger Ringrose (Broadchurch, Mr Selfridge) plays Mr Mayhew and David Yelland (The Crown, Foyle’s War) plays Sir Wilfrid Robarts. 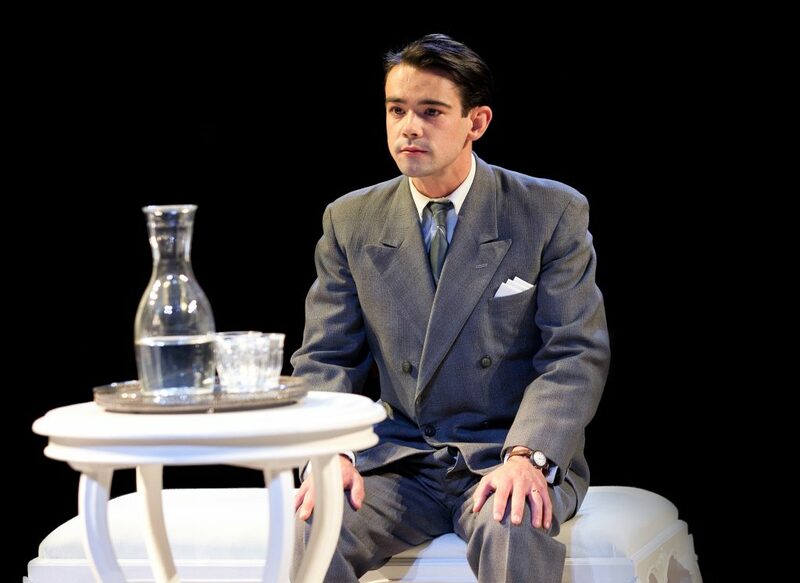 The cast also includes Richard Attlee, Elliot Balchin, Brig Bennett, Alexandra Guelff, Miranda Horn, Jon House, Jules Melvin, Hywel Simons and Alex Stedman. 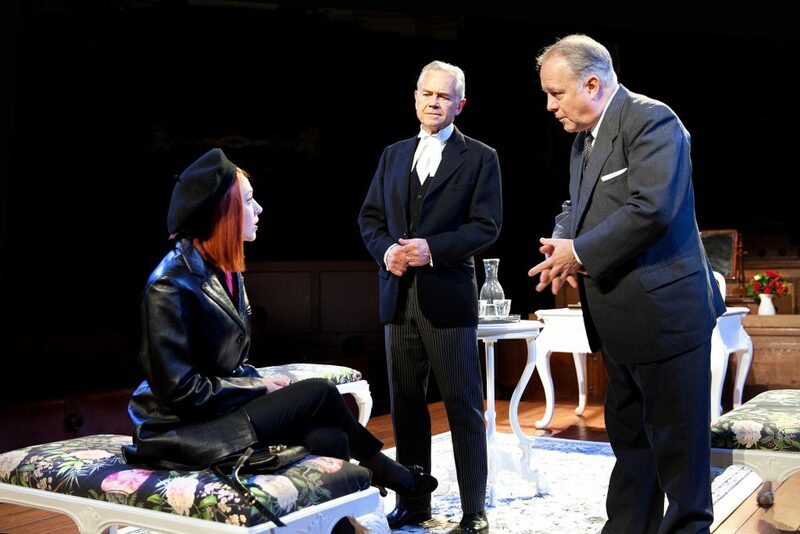 Catherine Steadman, David Yelland, Patrick Godfrey and Jack McMullen. The 2-hour show (with a 20-minute interval) is enthralling from start to finish. It’s a spectacular venue and a real treat to take a seat in The Chamber at County Hall. The audience even gets to sit in the Jury Box (and one audience member has to speak during the production). The seats have inbuilt speakers and these are cleverly used to add atmospheric sounds such as courtroom mutterings. The play is mostly set in the courtroom for the tense murder trial although there are also scenes at the Barrister’s chambers and one street scene. 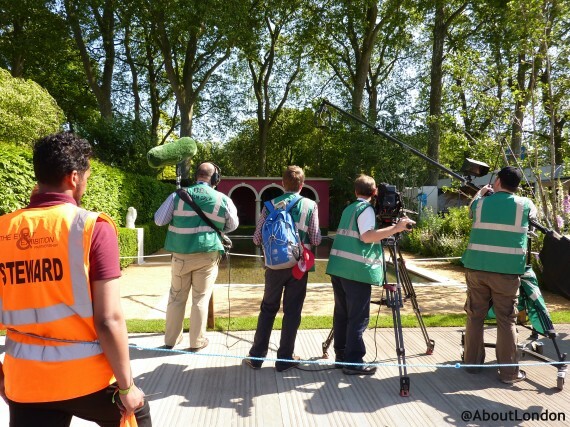 All of the actors are involved in the quick set changes and it’s a simple design that works well. The actors are superb although I’ll never understand why actors have to smoke during performances. You’ll spend the full two hours thinking you’ve worked it out – “No jury will believe a foreigner” – only for the twist at the end to come all too quickly. And then and just when you think you know who did it the plot twists again. 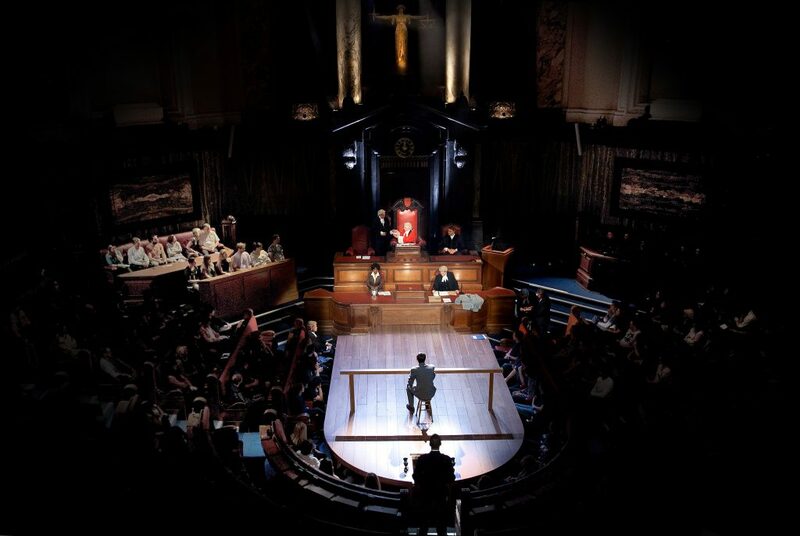 This is a rare opportunity to watch an immersive drama staged in a real-life courtroom. Don’t miss it. 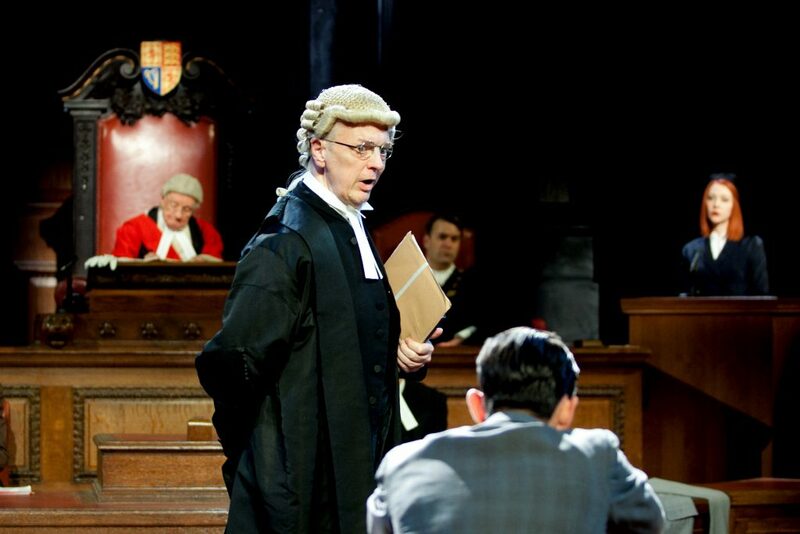 Witness for the Prosecution is running at London County Hall until 11 March 2018. 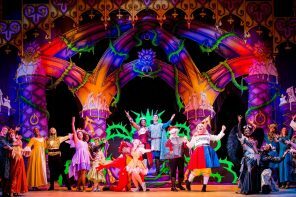 Tuesday to Saturday at 7.30pm, matinees on Thursday and Saturday at 2.30pm and on Sunday at 3pm. 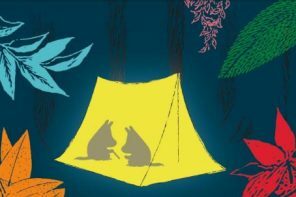 100 tickets available for every performance at £25 or under.